Following a rescue of four young men on October 23 2011, volunteer crew members Mark Champion and Andy Williams both received an inscription of thanks from the Institution on vellum for their roles. In-shore lifeboat helmsman, Roger Jackson who was awarded a bronze medal for gallantry for the same rescue, cooked a meal for 12 RNLI volunteers to thank them. 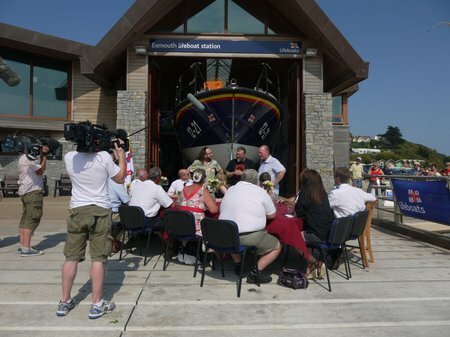 The diners ate al-fresco at the top of the launching ramp on July 26 with the surprise guest TV chefs Hairy Bikers revealing their help in the kitchen. 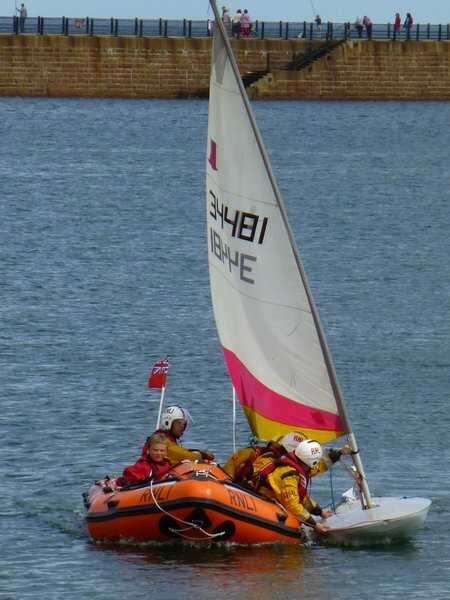 Sunderland RNLI inshore lifeboat assists the young sailor ashore during the ‘mock’ rescue demonstration. 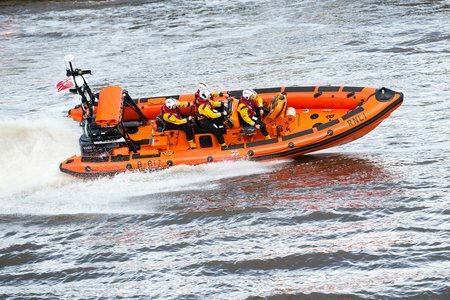 Sunderland RNLI Station has hailed their annual “Lifeboat Day” as huge success, raising just over £2,800 to go towards the charities running costs for the coming year. 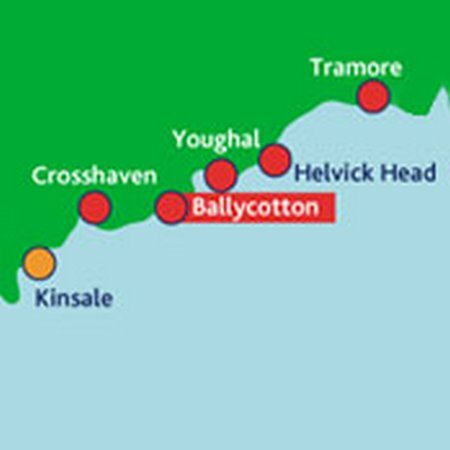 The small fishing village of Ballycotton in East Cork is always a good place to be over the August bank holiday weekend. 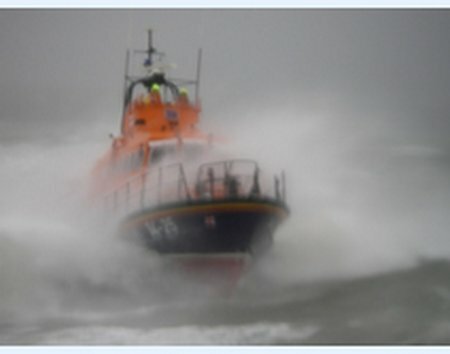 A full calendar of events is organised to raise funds for the all weather lifeboat stationed there. This years organising committee is planning fun events throughout the weekend for young and old, making sure all visitors have a good time. Members of the Sunderland RNLI Lifeboat Station and Lifeboat Guild invite supporters to the station’s annual “Lifeboat Day” which is to be held this weekend on 29 July 2012 [Sunday] 11.00am to 4.00pm in Marine Walk car park opposite the RNLI Lifeguard Base at Roker, Sunderland. 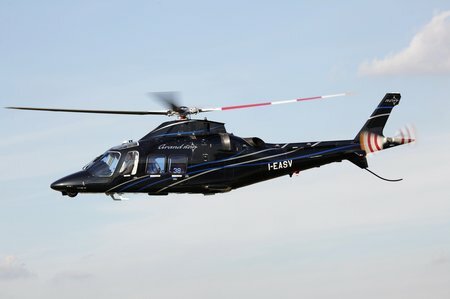 AgustaWestland, a Finmeccanica company, is pleased to announce that WISNIOWSKI® of Poland has signed a contract for a GrandNew light twin helicopter in VVIP transport configuration. 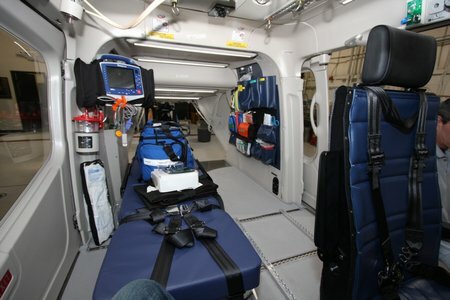 The aircraft, featuring an exclusive 5 seats interior, is expected to be delivered in late 2012. 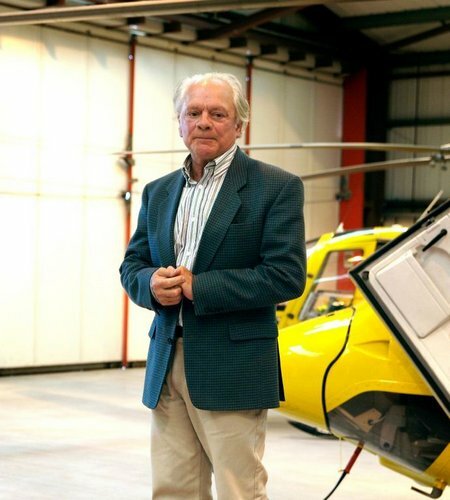 One of Britain’s most famous and respected actors Sir David Jason is getting behind the first united National Air Ambulance Week. Sir David has come a long way from his days as an electrician; since then he has won many prestigious awards for his work, with roles greatly varying from the comical Del Boy in Only Fools and Horses, to the more serious role of Jack Frost in A Touch of Frost. FORT WORTH, TEXAS (July 23, 2012) – Bell Helicopter, a Textron Inc. company (NYSE: TXT), announced today that 429 launch customer Mercy One of Des Moines, Iowa will receive a second Bell 429 helicopter from Air Methods. 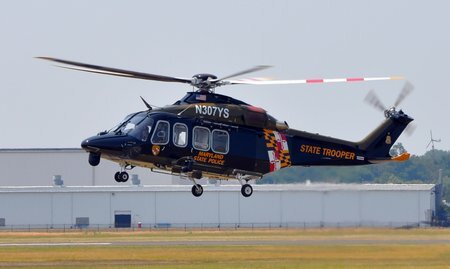 Mercy One currently operates an air medical critical care configured Bell 429 and will add a second helicopter, equipped with United Rotorcraft emergency medical services (EMS) interior. 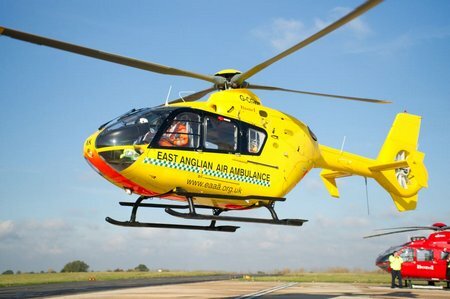 The latest draw for the East Anglian Air Ambulance (EAAA) Lottery has been made and this week’s lucky winner of £1,000 is Mr Blackmore from Thetford in Norfolk. 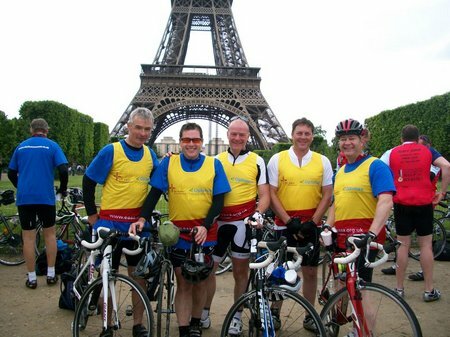 A group of local businessmen have just returned from an epic bike ride to raise funds for a local life saving charity.